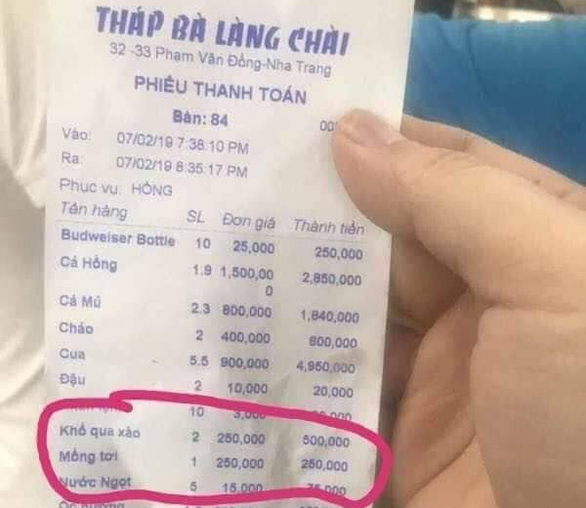 The bill for the Chinese tourists’ meals at Thap Ba Lang Chai Restaurant in the south-central city of Nha Trang is seen in this Facebook photo. A restaurant in Nha Trang, a famous beach city in the south-central Vietnamese province of Khanh Hoa, has been fined VND750,000 (US$32) after it was reported for overcharging a group of Chinese tourists. The penalty was imposed by the city’s market management agency on the owner of Thap Ba Lang Chai Restaurant, situated on Pham Van Dong Street, it said on Monday. A group of Chinese visitors had their meals at the venue on February 7, the third day of the Lunar New Year, and paid more than VND16 million (US$688) in total. The hefty price was charged for a simple dinner that consisted of such dishes as malabar spinach and stir-fried bitter melon, as the food was priced at VND250,000 ($11) apiece, according to a photo of the bill posted on social media. After the photo went viral on Facebook, the eatery owner explained that there was stir-fried beef in the vegetable dishes, which was why they were expensive. A team of inspectors from the Nha Trang market management agency were then sent to the restaurant and eventually concluded that all but the spinach and bitter melon dishes were listed in the bill according to regulations. 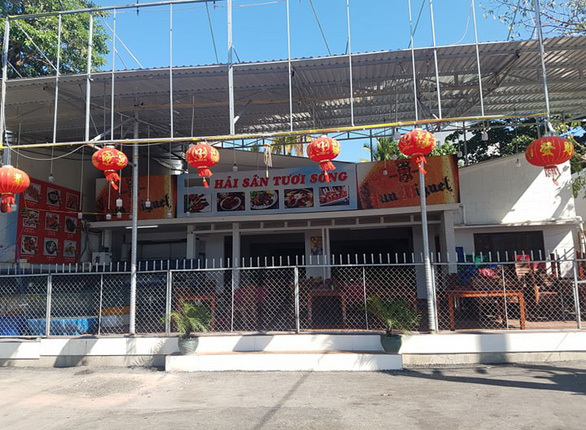 The owner was eventually fined for “failing to list prices of food and services in accordance with the law,” Truong Hai Dac, an official from the market watchdog unit, elaborated. The administrative fine is only VND750,000, Dac added. Thap Ba Lang Chai Restaurant is the second eatery in Nha Trang to grab local headlines with regard to tourists being ripped off. A group of Malaysian visitors was purportedly charged VND500,000 ($21.5) for each dish of stir-fried eggs and tomatoes when they had dinner at the Hung Phat Restaurant on Tran Phu Street also on February 7. The simple food apparently cost far more than they should have. Nearly a week after the bill of the costly meal went viral on social media, local authorities are still unable to verify the case as they were unable to contact the owner of the facility. “We have not received any information from the foreign tourists either,” said Pham Van Huu, head of the Khanh Hoa market management department. “We have repeatedly paid visits to the venue and tasked our officers with guarding the place until the owner shows up,” Huu continued. According to Nguyen Thi Le Thanh, deputy director of the provincial Department of Tourism, tourists are advised to call the agency’s hotlines (02583.528.000 and 0947.528.000) when they are overcharged by local service providers. Officers will be mobilized to deal with such cases within 15 minutes, Thanh stated, adding that it would be more difficult to promptly handle the case if customers make their complaints on social media.